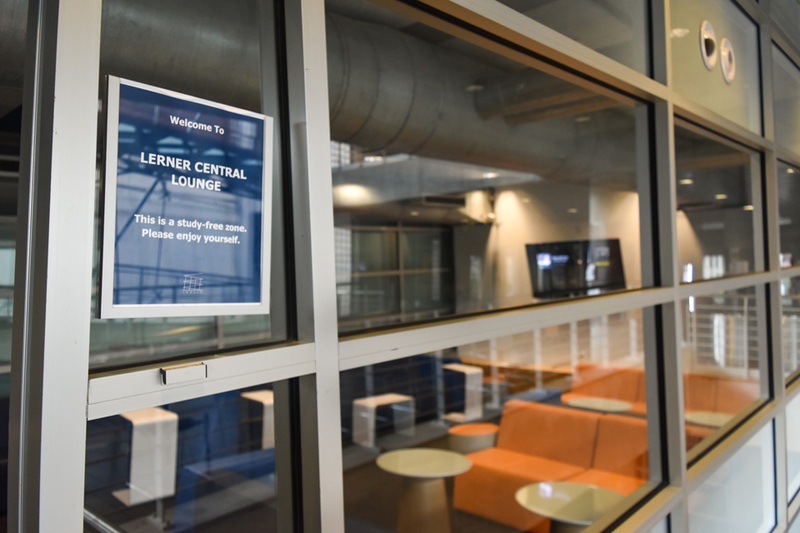 Students were unable to change Lerner for over a decade. What was different this time? 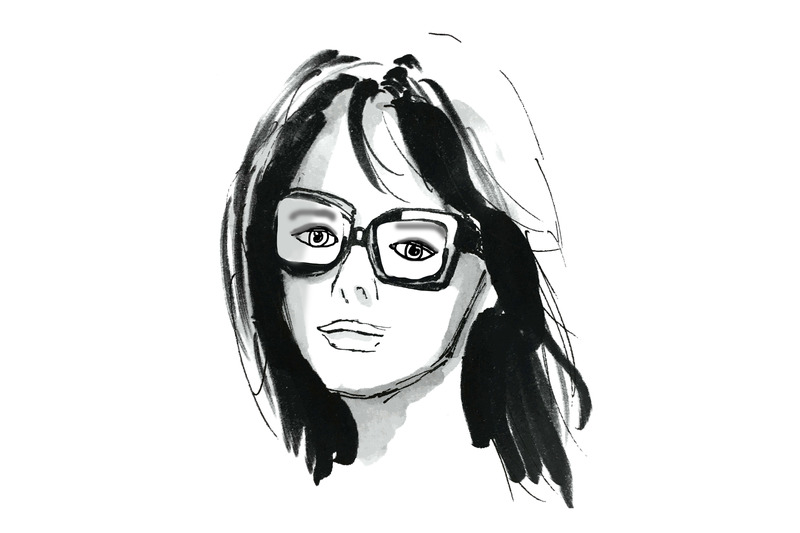 “A lot of the time, when people first come to Lerner … they don’t know where they’re going.” This sentence, pulled from a Spectator article published 10 years ago, speaks to my own first impression of Lerner. A few meeting rooms and some steel ramps spiraling toward ever-higher floors didn't indicate any concrete function the building was supposed to serve. I initially thought of Lerner as the home of Ferris Booth Commons and some administrative offices; later I saw it as a multifunctional space with some auditoriums and club meeting rooms. Yet through all this, Lerner never left me the impression of being a student center: a space where students freely meet and socialize; the epicenter of student activity on campus. The main issue in my eyes is its shortage of space devoted to students. It is true that Lerner provides 250,000 square feet of programmable space. Yet at the beginning of each semester, when all of Columbia’s student organizations are busy giving info sessions and making plans for the new semester, Lerner is frequently overbooked. Still, the more pressing issue lies in the shortage of space dedicated to the general student body—space where students can just hang out. The piano lounge on the second floor was supposed to serve this function, but it is forever cramped due to its size and functions more as a relaxed study environment than a social or recreational hub. 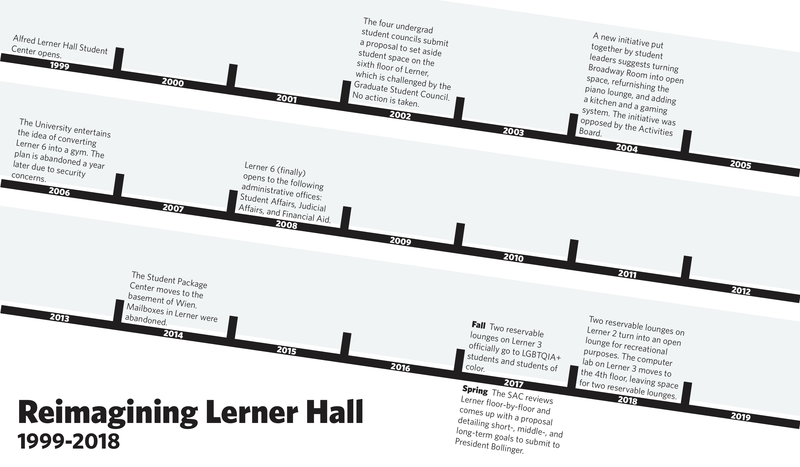 To address Lerner’s space problem, the Student Affairs Committee proposed a series of short-, medium-, and long-term objectives for the reallocation of space in the hall in the spring of 2017. Its intent was to create a sense of community and increase the quantity and quality of student space on campus. The short-term goals—to create dedicated space for LGBTQIA+ students and students of color—were achieved in the fall of 2017, while the medium-term objective—to create an open student lounge with recreational components on Lerner 2—was just achieved this semester. Two out of three phases into the project, relatively little new space (quantitatively speaking) has opened up to students. But within the larger context of Lerner’s history of student demand for change meeting administrative inaction, this small renovation is hugely significant. In 2016, the The Eye characterized Lerner as the most recent battleground in Columbia’s “War on Fun.” And for good reason—ever since its erection in 1999, Lerner has been subject to all sorts of criticism. The ramps are the central target, mainly for taking up space and slowing down traffic between floors. But other architectural features have been criticized as well, such as the building's hollowed center, which not only wastes more space, but also allows free transmission of sound between floors. To top it all off, administrative offices take up a significant amount of the functional spaces, especially between the fourth and the eighth floors, despite nearly two decades of student advocacy for more student space. 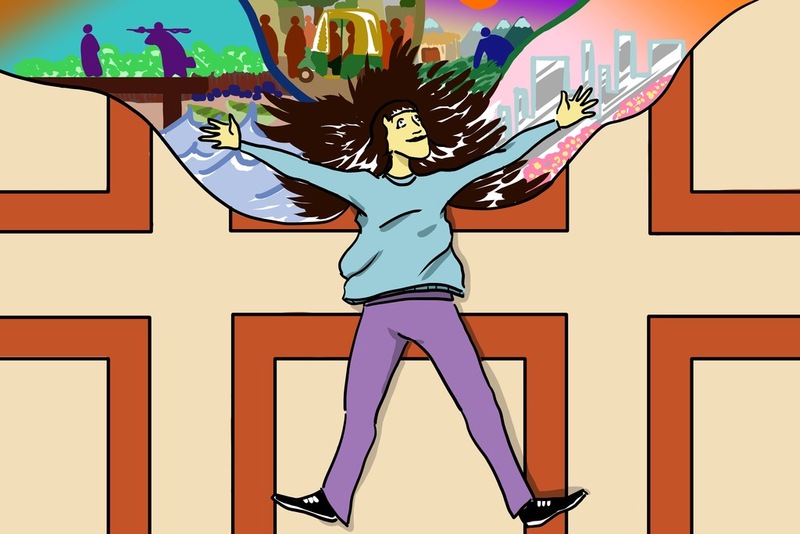 In 2003, all four undergraduate student councils banded together behind a joint proposal asking the University to set aside for undergraduates what was at the time over 5,000 square feet of unused space on the sixth floor. Even before meeting any obstacles from the administrators, their demand was challenged by a proposal from a different group of students on campus—the Graduate Student Advisory Council—who claimed the right to more space than their “poorly equipped” room in Philosophy 301. Facing a rather muddled situation, the administration’s decision was characteristic of the course it would adopt in the years to come—to “not rush a decision.” The proposal faded into oblivion; as student leaders graduated and student councils were reorganized, the plan was abandoned. Another student-led proposal was submitted by a group of CC students, some from the Columbia College Student Council and some not, in 2012. The major goal of the Student Space Initiative was to make Broadway Room a non-reservable lounge for general student use. Like its predecessor nine years prior, the proposal met internal resistance—this time from the Activities Board at Columbia, an undergraduate organization that oversees many of the dance, theater, and music groups who practice in Broadway Room. The crux of this conflict lay between the interest of student organizations and that of students as individuals. Both sides had good arguments for taking Broadway Room; the campaign went into a stalemate and was eventually abandoned. But just weeks ago, the dream of opening a new, non-reservable lounge in Lerner was finally realized. 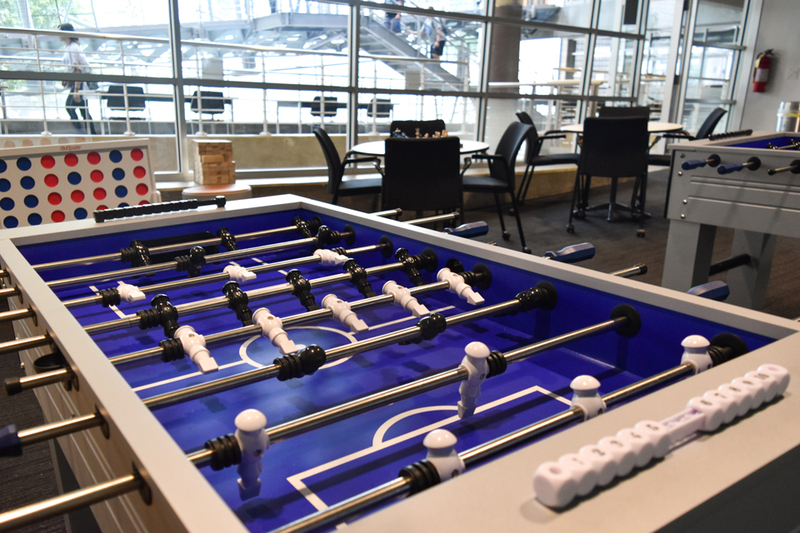 The east and west ramp lounges on the 200 level, which previously were up for reservation only by student groups, have been converted into a large open lounge with recreational facilities. The lounge is equipped with spacious sofas and good air conditioning. When I walked in to explore the new space for the first time, two students were sitting at the entrance, playing jenga. At the other side of the lounge lay an air hockey table and two foosball tables, waiting to be used. One wall-mounted television was softly playing pop music while the other had SpongeBob SquarePants on it. Other aspects of the renovation are less conspicuous: To compensate for the loss of the reservable lounges on Lerner 2, two new ones were built on the western end of the third floor, replacing the former computer lounge. 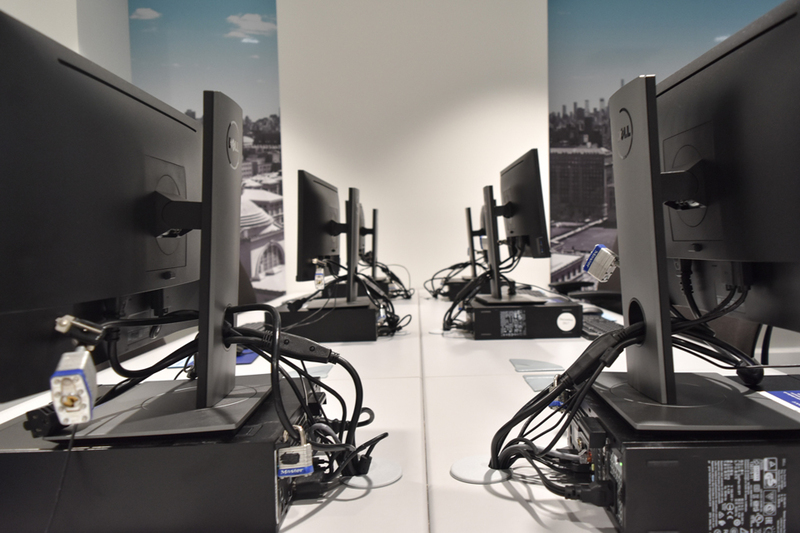 The computer lounge, in turn, was relocated to the south-eastern corner of the fourth floor, occupying a space formerly used by Technical Services. Itching to figure out how success emerged from a history of failure—what was different this time?— I sit down with Joshua Schenk, a Columbia College senior, former co-chair of SAC, and one of the students who advocated for the renovation project. Back in 2017, when Schenk ran for office, one of the primary motives of his campaign was space—or rather, the scarcity of space on campus. He set out to allocate more of it. Lerner, the building that is supposed to serve the student body most directly, became the focus of his attention. Schenk and his colleague, Izzet Kebudi, a senior in the School of Engineering and Applied Science, spent the first two months of their spring 2017 semester surveying every floor of Lerner, evaluating whether each part of the building was used reasonably. They ended up producing a list of recommendations for transforming Lerner into a more student-oriented space, with concrete short, medium, and long-term objectives, which they typed up into a formal memorandum and sent to President Bollinger. They then made a presentation at the Senate plenary last April, where they laid out their preliminary plan. The initiative also gained momentum from a campus-wide push for improving the quality of students' mental health at the wake of a series of student suicides. Reporting from early 2017 also showed that students of color are especially at risk for mental health crises. The Columbia College Student Council suggested building dedicated centers for LGBTQ students and for students of color in Lerner in a resolution they passed in January, which later merged with SAC's renovation plan. Since the spring of 2017, Schenk, Kebudi, and other students have been working closely with Scott Wright, Vice President for Campus Services, and Honey Sue Fishman, director of Lerner Hall, to implement SAC’s recommendations. 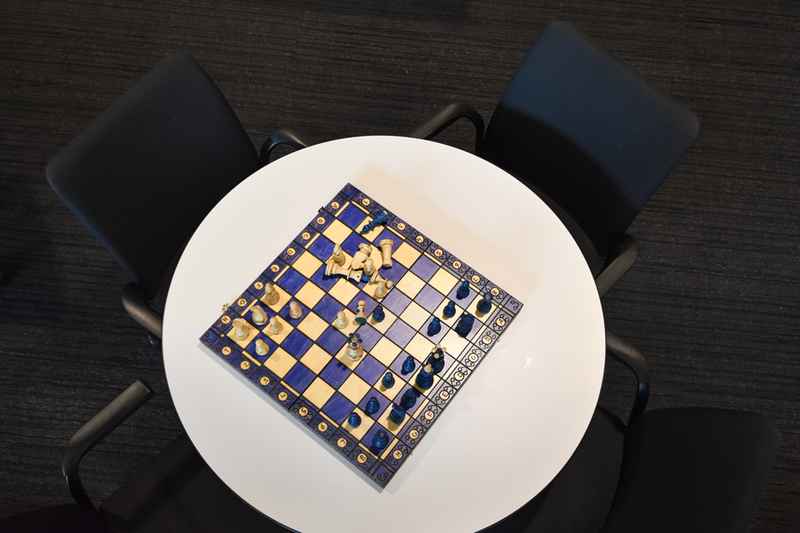 The two students were included in every stage of the decision-making process, right up to the colors of the carpets, the types of chairs, the layout of the furniture, and how many game tables to purchase. However, not all ideas from SAC’s original proposal have come to pass—some of them were recategorized as “long-term goals,” and we still do not know when to expect those changes. For example, while the proposal outlined a plan to create a central lounge that connects the second, third, and fourth floors, only the renovation of the second floor has happened so far, as a medium-term objective. Today, the ample space behind the walls running along the third and fourth-floor ramps is still sitting empty. When I ask Schenk about these unfulfilled objectives, he shows no expression of dissatisfaction. The reason for the postponements, he explains, is simply the time it would take to implement those aspects of the original plan; he believes the best option is to create changes one step at a time. SAC's flexibility in negotiating the renovation certainly runs consistent with Schenk's attitude: both the group and the guy were willing to keep their suggestions modest and to put themselves in the position of the administrators. Schenk tells me that Wright and Fishman were “fantastic” people to work with and that they seriously considered everything he asked them about. I was struck by how conciliatory—if not conservative—an attitude Schenk seems to take on the space issue. When I bring up the notion of Columbia’s "War on Fun," Schenk consistently denies its existence. He believes that when previous attempts to remodel Lerner were made, the administration did not disagree with students or find their ideas bad—it just wanted to make sure the outcome would be positive for all students across campus. In an interview with Spectator in 2006, the former president of Columbia College Student Council, Matthew Harrison (also the first organizer of the Glass House Rocks in Lerner), identified the lack of collaboration among different groups of interest as the reason for the student body's continued failure to gain space in Lerner. The absence of a unified voice led administrators to seek smaller scale solutions and kept any substantial changes from taking place—“It's big and it's complicated and no one wants to end up with egg on their face,” Harrison explained. Considering past controversies, I am a bit surprised when Schenk tells me that SAC's proposal met no opposition when it was first made public. But he explains: "I think there is a consensus across the University that we need space for students from all schools to come together and form a community… There was no pushing-backs, saying ‘We shouldn't have a food bank’ or ‘We shouldn't come together to play games.’"
The fact that the renovations even happened is an objective success. But if we count the sheer number of rooms they have opened up to students so far, the outcome might be a bit deflating. Certainly the newly vacated space is not going to make room-booking significantly easier or gather the students into a more close-knit community. So, how much space is enough space? When will we be satisfied? 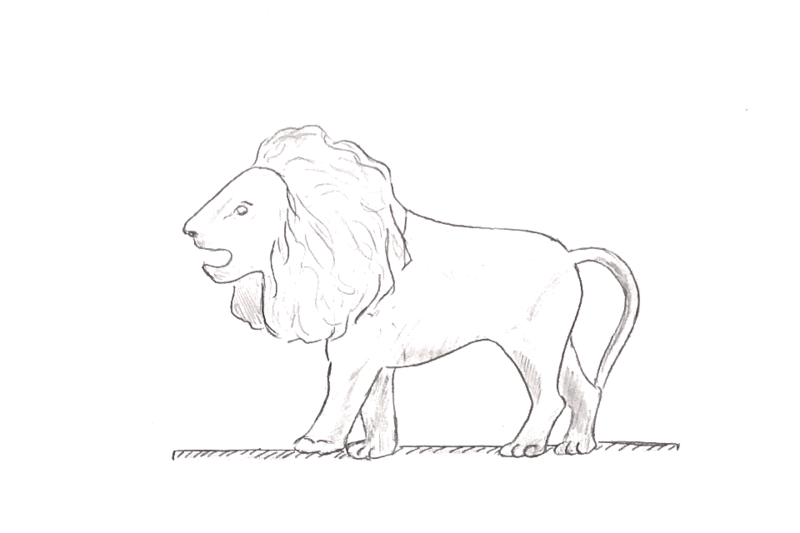 If we cannot find a definite answer, at least we can imagine what a satisfying Lerner might look. A simple answer might be a Lerner with zero administrative space, dedicated completely to student use—the glorious conclusion to the years-long “War on Fun”—that is, assuming that removing the ramps altogether is off the table. If you are a less radical thinker, you might want to keep the Office of Student Advising and the Undergraduate Student Life, since they serve the students most directly. In fact, these scenarios could be more than mere fantasy. In the same document as contains the plan for the current renovation, there is another long-term proposal written but not yet realized. SAC hopes to relocate all the Columbia Health-related offices on Lerner 7 and 8 (Sexual Violence Response and Counseling and Psychological Services) to a unified health center outside the main campus (initially planned to be on Amsterdam Avenue, next to St. Luke's Hospital). This renovation, if completed, will produce almost two entire floors’ worth of free space. The recently completion of the “middle-term goals” puts us in a good position to ask where we stand in the history of this embattled building. Lerner’s future looks exciting even if it’s uncertain, and one thing seems increasingly likely: Students will play a crucial role in shaping it. Have fun leafing through our first issue!